The Horus Heresy returns with the triumphant laughter of thirsting gods and oceans of bloodied carnage in this latest instalment by Aaron Dembski-Bowden. I will say this now. The First Heretic is without any doubt in my mind, my number one favourite novel. Chastised and rebuked by the Emperor, forced to kneel before their brothers in shame, made to be observed by outsiders like disobedient children, and told that all they have ever achieved is worthless before He who they are pledged to serve, the Word Bearers are at their darkest hour in all of their history. In the ashes of Monarchia, a city destroyed for the crime of faith, the XVII Legion undergoes a quest for truth that will carry them to the edges of the galaxy, the edge of sanity, and the edge of reality itself to a dead empire where a god was born. To keep their faith in an uncaring universe, the Word Bearers must sell their very souls in pursuit of the truth. ADB has created an all-star cast for his first HH novel. The first protagonist is Argel Tal, captain of the 7th Assault Company and Subcommander of the Serrated Sun Chapter is very ‘human’ for an Astartes. He is able to converse and even joke with the Imperial Army personnel he interacts with, and shows us the Word Bearers through a warrior’s eyes rather then a priest’s. Through the novel he is the voice of reason and shows a side that most Astartes could never, kindness. The second protagonist is Lorgar himself. The Aurelian, Urizen and the one son of the Emperor, who did not want to be a soldier. 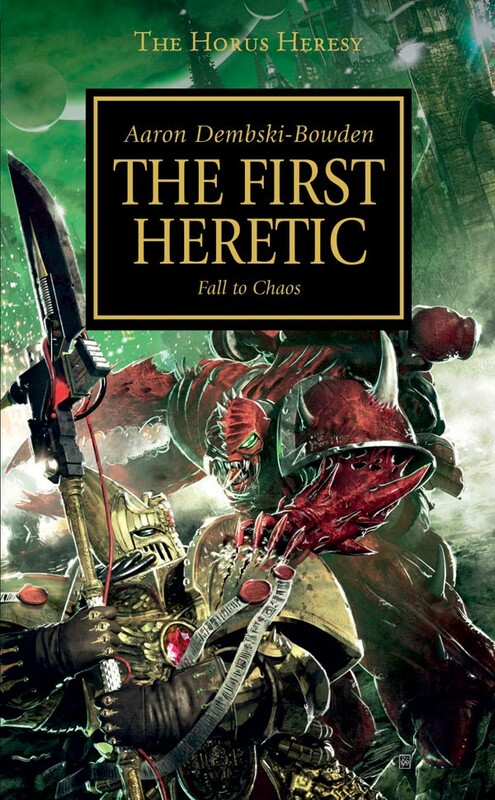 Lorgar’s faith is strong but is shattered early in the novel, and through the novel we see his desire for truth and fundamental belief that faith will unite humanity take the Seventeenth Son and his own Sons of Lorgar across the galaxy to the precipice, and to the place where gods and mortals meet. Lorgar may have seemed distance, perfect and almost beyond human in his few previous appearances but now that is stripped away and the true machinations of the Golden One are revealed. His desire to enlighten and save humanity from the darkness of a godless existence will change the face of the galaxy forever. Other major characters include Xaphen the 7th Company’s Chaplain who preaches the word of Lorgar both for the Emperor and for the Primordial Truth, Aquillon the Occuli Imperator, or Eyes of the Emperor, a Custodes warrior who becomes a brother to Argel Tal, one who he must eventually betray, and Cyrene the Blessed Lady who is the one survivor of the destroyed city Monarchia and serves as a confessor to the XVII Legion and a friend to Argel Tal, and in a strange irony, the only one who can hear the sins of the 7th Captain and forgive him. The action in the story is remarkable. As Argel Tal grows throughout the novel the combat changes, from that of typical Astartes warfare to something else entirely, and ADB has done it fantastically and created a true standard for the Possessed Chaos Space Marines, both in personality, actions and their combat styles. The novel also answers many mysteries. Hints are given towards a mystery that can never be revealed, so speak the Lords of Black Library, and finally answers one age-old mystery in a way that nobody could have ever seen coming. But more are created or resurface, but none are left alone and we now have many more answers as to the Heresy, the Primarchs both found and missing, and the nature of the Emperor, but many more questions too. The pacing is quite good. At no point did I feel rushed or slowed by what was happening, something always had my attention either combat, plot developments or a monumental moment not just for the novel but for 30k in a whole. The pace always reflected the moment of the novel, and was timed and moved appropriately. The novel ends on a prelude to the future, a battle that is known to all Heresy fans and that hopefully is not too far away in the future. I do hope that we will see Argel Tal again, and that ADB is not done with him yet. 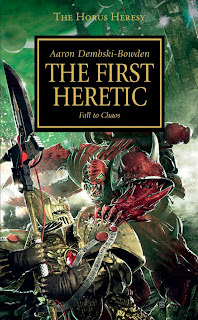 I have no reservations about giving The First Heretic a 10/10, if I had too I would take back my 10/10 score for A Thousand Sons because even that incredible tale falls before this quest for truth, for its fantastic story, exceptional characters, revelations that will shatter the minds of those who read them, my own sanity has been damaged by these somewhat, and for taking a Legion that although many feared would be undone by a new author and made them his own. Anthony Reynolds may have written the Word Bearers in the 41st millennium, but in the dark times of the Horus Heresy, they belong to Aaron Dembski-Bowden. Should you buy this book?… if you don’t have this book on pre-order or in your collection already then the glory of Chaos has driven you insane. This is a must have even for those who have not read the Heresy yet. Enjoy this book, all those who read it. I know I have and will again in the future when I re-read it.